“Massachusetts Invented America” reads the shirt sold by Barstool Sports, a website popular for its bro-culture theme. The obvious joke is the Commonwealth’s leading role in the American Revolution, though the real irony lies in the existence of the Massachusett tribe a millennia before the arrival of European colonists and their subsequent annihilation courtesy of the invaders. The other unintended irony is that the Massachusett literally led the charge in “inventing America”: Crispus Attucks, the first person killed in the Boston Massacre, was the son of a black man and a Massachusett woman, and the direct descendant of John Attucks, an Indian executed for treason in 1676 during King Philip’s War. Regardless, in 1869, the Massachusetts legislature passed the Indian Enfranchisement Act, granting citizenship to the Commonwealth, complete with the right to vote, to the Massachusett, but also eliminating their status as a sovereign nation and allowing the sale of Indian land to non-Indians. Thus, Massachusetts completed its total appropriation of the Massachusett name by legally erasing the tribe. As a lifelong resident of Massachusetts and Rhode Island, I have always been surrounded by indigenous place names, though their utility as a form of erasure in plain sight of Native Americans and culture has only recently dawned on me. While the focus today largely lies on the racist appropriation of indigeneity by sports teams, understanding the history and meaning behind place names in southeastern New England accurately portrays the scale to which indigenous culture has been appropriated throughout the United States. The native geographer has come and gone in New England; as is true of so many aboriginal inhabitants, his was a light touch which left little impress upon the land. Because the White emigrant to the region had little understanding of the various local dialects, and even less interest in native cultures, by and large the names the Indian gave to his landmarks have disappeared. Many of these have survived in extremely distorted forms, and only a small proportion of the currently-used place names are clearly defined and readily translatable Indian terms. This is an unfortunate loss to our historic heritage. 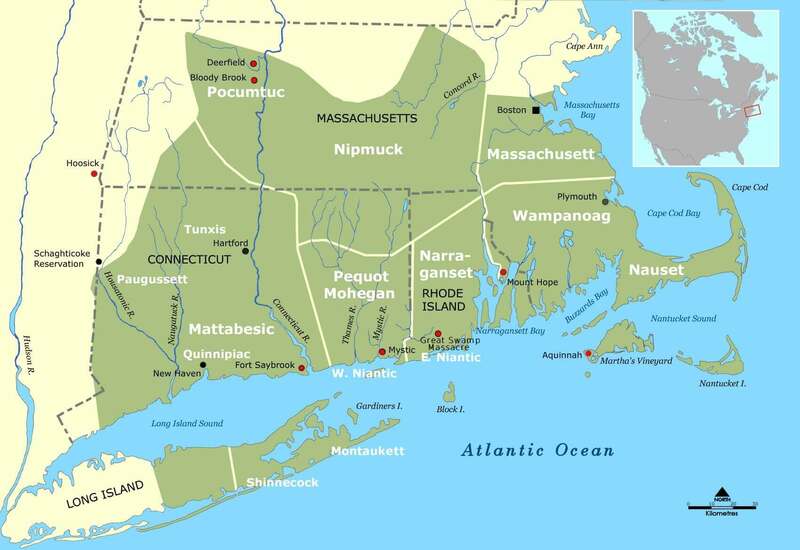 When discussing indigenous languages in Massachusetts and Rhode Island, all fall under the Algonquin family; the dialects included Massachusett, Natick, Nipmuc, Narragansett, Wampanoag, and Pocumtuck. Unfortunately, New England was one of the first colonized areas in the United States, which is to say that the Indigenous Peoples were decimated early on. The last documented reference to Wampanoag being spoken dates back to 1833; likewise, all the languages listed above are considered “dead” languages. This means that the meaning of many indigenous place names has been lost to the scythe of colonization. The problem of losing the original meaning of place names is compounded by the fact that uneducated settlers, in attempting to use indigenous names and words, butchered them due to their unfamiliarity with the language. A glaring example of this is Jamaica Plain, a Boston neighborhood. While its name seems to allude to the island of Jamaica, it is actually a poor rendition of Kuchamakin, a sachem of the Massachusett tribe in the late 1600’s. Another more understandable example is Moskituake, Rhode Island, which eventually became Mosquito Hawk, an obvious rendering of the sound. Monosyllabic words were rare, but usually could be pronounced as spelled, e.g. Paug. Words with two or three syllables usually stressed the first syllable, e.g. Wekopee was pronounced Week’o-pee. Polysyllabic words tended to stress the latter ends of words, e.g. Connecticut was pronounced Co-nek’ti-kut. Spelling, unfortunately, was no easier. Given that there was no Native American equivalent of the Latin alphabet, spellings were based off of pronunciations (which we know were often errant). Lake Winnipesaukee (which means “deep water in a high place”) in New Hampshire had over 50 different variant spellings before the aforementioned one was legalized in 1937 by the New Hampshire General Court. In short, as European colonists stole indigenous lands, they simultaneously appropriated the words, names, pronunciations and spellings created by Native American cultures. In doing so, they not only crippled native peoples centuries ago, but also removed the meaning behind their place names forever: Massachusetts no longer refers to the “people of the great hills”, but to a state created by imperialism. Despite the desecration of place names throughout most of New England, some advancements in recent decades leave room for hope. Martha’s Vineyard, known as a popular island tourist destination off the coast of Massachusetts, has long been the home of the Wampanoag people. Located in the town formerly known as Gay Head, the tribe successfully petitioned for a vote to change the town’s name. In 1997, by popular vote of 79 to 21, the town changed its name to Aquinnah, which means “land under the hill”. By reclaiming their town under its original name, the Wampanoag symbolically reestablished control over their territory and their culture. However, the Aquinnah Wampanoag, along with the Mashpee Wampanoag, are the only two federally recognized tribes in the Commonwealth of Massachusetts, and no other tribe has been able to influence such a change. According to Wampanoag lore, Wôpanâak (the Wampanoag name for their language) was destined to go away, only to later come back. In 1993, the Aquinnah and Mashpee tribes launched the Wôpanâak Language Reclamation Project aimed at bringing back the language considered dead for over 160 years. Using Bibles translated to Wôpanâak aimed at converting the Wampanoag people in the second half of the 17th century, the project has resulted in the creation of dozens of books of phrases, prayers, stories and teaching tools. As of 2008, an estimated 200 out of about 4,000 Wampanoags had taken a Wôpanâak class and 7 were considered fluent. Reclaiming indigeneity in a country whose history is marked with repressing or killing Indigenous Peoples is an uphill battle to say the least. If territory is the physical manifestation of what has been stolen from Native Americans, then the barbarized use of their place names only serves to reinforce their stolen identity. However, the Wampanoag have proven through their ability to change a place name, along with the resurgence of their once-dead language, that the possibility of remedying centuries of colonialism still exists.